Many thanks to Siyeh and his parents for a great weekend in the country! Practicing our "Sit/Stay" in the open field (and for the camera). 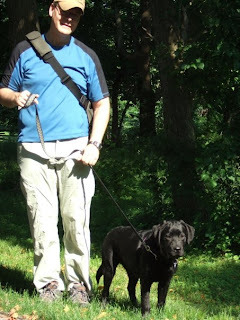 Working on Loose Leash Walking and Heeling with Bob and Siyeh. 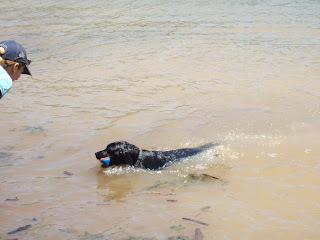 Siyeh's first water retrieval session -- such a natural! With temperatures already rising into the 80s in NYC tomorrow and sure to go even higher in the weeks to come, pet owners need to be aware that days in the sun are not always so fun for our pets. Pets can suffer from the same problems that humans do in hot, humid weather such as overheating, dehydration and even sunburn. To keep your pet happy and healthy this summer, here are tips from NYC Pet Expert & Founder of It’s A Dog’s Life New York, Elena Gretch, CPDT. 1. Limit direct sunlight and use sunscreen on light coated pets. Short haired dogs with light colored coats and skin need to be protected. Topical sunscreen should be applied prior to sun exposure. 2. Protect from fleas, ticks & heartworms. 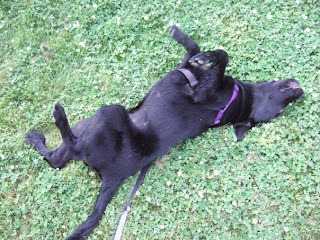 Flea & tick infestations typically occur in warmer weather. Lyme Disease is carried by deer ticks which are prevalent in Eastern Long Island, The Hamptons, Upstate NY, and CT, so I recommend that you use a monthly topical preventative treatment such as Advantix or Frontline Plus. You should be using heartworm medication year-round, but it is essential to use it in the summertime when mosquitoes that carry the illness are at their peak. 3. Tote a portable water bowl. Keeping your pets hydrated on hot days is crucial. Guardian Gear makes easy to carry, fold up water bowls for convenient use on days in the park or on the beach. 4. Use caution on road trips. If you’re hitting the road this summer and taking your pet, seat belts and car crates can keep both you and your pet safe in the event of an accident. Also, stop every 2-3 hours for a 15-minute walk and never, ever leave your dog in a parked car. 5. Use a life vest in strong currents. Yes, dogs can swim, but if you’re headed to the beach or the river, a good canine life vest can encourage swimming AND it protects your pet from the inherent dangers like fatigue and rough water. The US Coast Guard, which regulates human life jackets, does not regulate vests for pets, so be sure to have your pet fitted for the vest that will work best. 7. Calm thunderstorm anxiety. Many of my clients have dogs that get frightened by thunderstorms. One option is the Storm Defender Cape, which discharges static electricity that builds up in the fur and helps to calm your dog down. NYC Pet Expert Elena Gretch is a former Wall Street gal turned certified dog trainer (CPDT) and the founder of It's A Dog's Life New York, a premium pet care & training service for some of New York’s most prestigious furry four-legged residents. Elena has appeared on CNN’s Larry King Live and regularly appears on New York’s WPIX11 Morning News. She was also featured in amNY and has also provided expertise for pet training stories from the Associated Press, Los Angeles Times and London Telegraph.